Recently, the Chamber Foundation joined our partners in releasing a report that showed Illinois has had significantly weaker growth in data center markets than surrounding states that have data center incentives. The report, published by Mangum Economics, compares the disparity of data center capital investment growth and jobs created between Illinois and neighboring and competitive states and examines the state tax policies used to attract and grow the industry. Today, 30 states have incentives specifically targeted at attracting data centers as part of expanded economic development efforts. Since 2012, 24 states have enacted legislation aimed at capturing a greater percentage of data center growth. Illinois should consider these tax incentives to ensure the direct and indirect benefits from the construction, operation, and ancillary growth that occurs over the lifetime of these facilities. WASHINGTON, D.C. – The U.S. Chamber of Commerce Foundation today announced Joseph B. Henning, IOM, CAE, president and CEO of the Aurora Regional Chamber of Commerce graduated from its premier business leadership program. The inaugural Business Leads Fellowship Program trained and equipped leaders from state and local chambers of commerce with resources, access to experts, and a network of peers to build their capacity to address the most pressing education and workforce challenges. Following a competitive application and selection process, Henning was selected along with 34 other state and local chamber executives to participate in the inaugural class. The four-month program, which ended this week, covered the entire talent pipeline, including early childhood education, K-12, higher education, and workforce development. This week, we will be sending out a link to the fourth annual Economic Pulse Survey. • Association Health Plans to save employers money. Until next month, enjoy time with family and friends. Here’s to the region’s prosperity in 2019; cheers! This week, we will be sending out a link to the fourth annual Economic Pulse Survey. Results of the survey will be shared with the business community at our annual lunch event. This year, the lunch is scheduled for early February at Stonebridge Country Club. Be sure and watch your email for the survey link. The House and Senate released their 2019 spring schedules for the 101st General Assembly. The current General Assembly will meet one more time during “Lame Duck Session” on Jan. 7 and 8. The new General Assembly will be sworn in on Jan. 9 and the Governor will be sworn in on Jan. 14. On Feb. 20, the Governor will present the Budget Address. Other dates of note include the Senate Committee deadline on March 22, the House Committee deadline on March 29, and the Senate and House Third-Reading Deadline on April 12. Committee and 3rd Reading deadlines may be extended by the Speaker or the Senate President. Additionally, individual bills may have their deadlines extended. Adjournment is scheduled for May 31. Tuesday, Jan. 15, 8:30-10 a.m.
Wednesday, Feb. 6, at 11:30 a.m. Thank you everyone who turned out to the 2018 Annual Holiday Celebration (left), including sponsors, elected officials, partner organizations, and members. We wish all of you a safe and wonderful holiday season. Nearly two dozen members joined us for the kick-off organizational meeting of the Aurora Young Professionals this month. Discussion and planning was held for activities in 2019, including professional development, community support, and more. For details on upcoming events and opportunities to market your brand in partnership with Chamber events, contact Maureen Gasek at (630) 256-3182. For these and more photos of recent activities, please visit our Facebook page. Congratulations to Luigi’s Pizza and Fun Center on celebrating 65 years of service to the Aurora community. Recently, #AuroraChamber staff and Ambassadors presented a celebration plaque to Bill Poss and his team for the milestone. If you have news to share with your fellow members, please forward to info@aurora-chamber.com. Be sure and check out our blog and social media for what’s happening in our region. In three weeks, voters have a wide range of issues to consider. Friday, Oct. 19, from 8:30 a.m. to 11:30 a.m. Annual Celebration of Membership at 11:30 a.m.
Our featured presenter will be Tom Kuczmarski. He is president and founder of the global consulting firm Kuczmarski Innovation and an internationally recognized expert in the innovation of new products and services. Kuczmarski is the author of seven books on innovation and leadership, including his most recent book, Lifting People Up: the Power of Recognition (Book Ends Publishing, 2018), co-authored with Dr. Susan Smith Kuczmarski. Please note: Innovation Summit registration includes ticket to Annual Celebration of Membership at 11:30 a.m. In three weeks, voters have a wide range of issues to consider: the state of the economy, taxes, regulations and legislative initiatives, and the overall political landscape in Springfield and Washington. Whatever your reason for voting, there has never been a more important time to make your voice heard. On Nov. 6, Illinoisans will go to the polls to elect our representatives to the U.S. House of Representatives, State Constitutional officers, Illinois General Assembly members, and County Board members. By being a part of the political process, we can elect officials who are willing to get things done in support of pro-growth policies that promote opportunity and job creation for our region. The business community has too much at stake to sit on the sidelines. The single most powerful tool each one of us has is our voice and our vote. Friday, Oct. 19, 8:30 a.m. – 1:30 p.m.
Thursday, Oct. 25, 8 – 9:30 a.m.
Friday, Oct. 26, 12 – 1:30 p.m.
Ribbon Cutting @ 12:30 p.m.
Monday, Oct. 29, 11 a.m. – 1 p.m.
Friday, Nov. 2, 9 – 10:30 a.m.
Monday, Nov. 5, 11 a.m. – 1 p.m.
Friday, Nov. 9, 6:30 – 8:30 p.m.
Ribbon Cutting @ 7 p.m.
Wednesday, Nov. 14, 8:30 – 10 a.m.
Wednesday, Dec. 5, 4:30 – 7:30 p.m. Recently, the Aurora Chamber team and membership celebrated the 30th anniversary of Mercyfest (left) with Our Lady of Mercy and the 50th anniversary of the Aurora Regional Fire Museum (right). For these and more photos of recent activities, please visit our Facebook page. The #AuroraChamber recently was published in The Daily Herald. 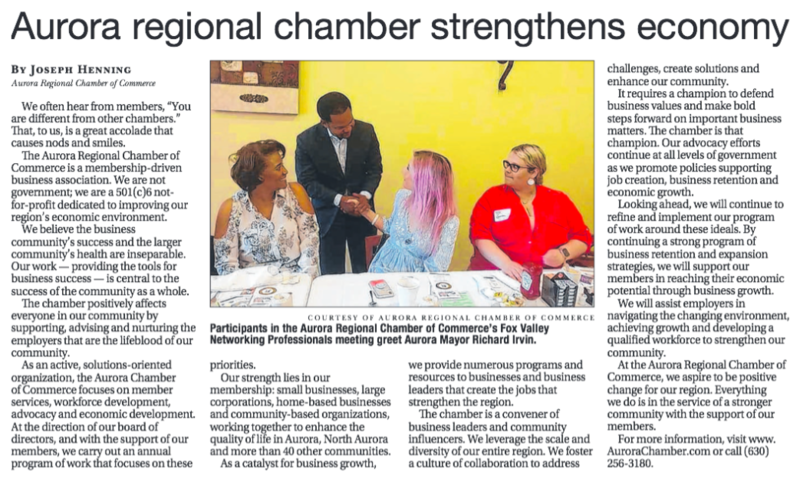 Titled Aurora Regional Chamber Strengthens Economy, the article highlights the organization’s (and its members’) role as catalyst, champion, and convener for our region’s successes. To read the article, click here. The Aurora Regional Chamber of Commerce has a number of shared interest groups (SIGs) to support those members with, well, a shared interest. This month, we’d like to highlight the Retail Roundtable, sponsored in part by Fox Valley Mall. Recently, the group met to discuss the upcoming #ShopLocal Saturday on Nov. 24. In addition, those in attendance shared concerns and tips. For those unable to attend, please click to download our 2018 Shop Local Tip Sheet. For details on the Retail Roundtable, please contact Maureen Gasek, director of events & marketing, at (630) 256-3182. You are currently browsing the archives for the catalyst category.